Image courtesy of the Beyeler Foundation. 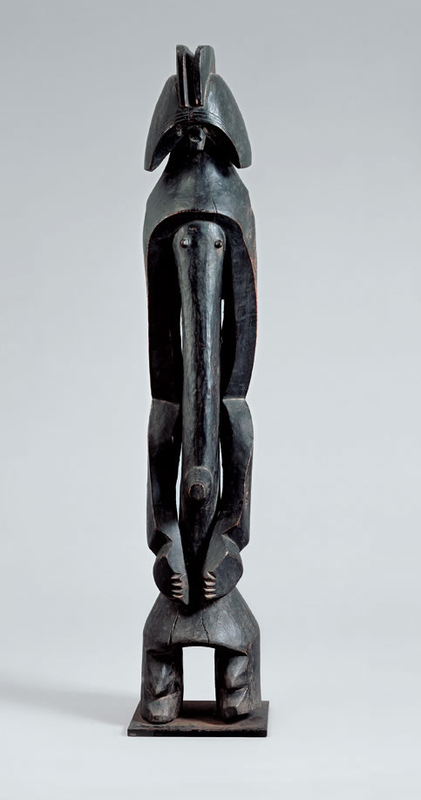 This famous Mumuye figure, in the collection of the Fondation Beyeler, was exhibited to high acclaim in New York more than a quarter century ago during the exhibition Primitivism in Twentieth-Century Art (1984). It was then likened by the New York Times reviewer of the show to Darth Vader from Star Wars – a comparison that succeeded in living through all these years. As revealed in a footnote in Central Nigeria Unmasked (pp. 573-574, footnote 17), the Fowler Museum in 2011 contacted George Lucas to inquire if he was indeed influenced by African art while coming up with the design of Darth Vader’s helmet. 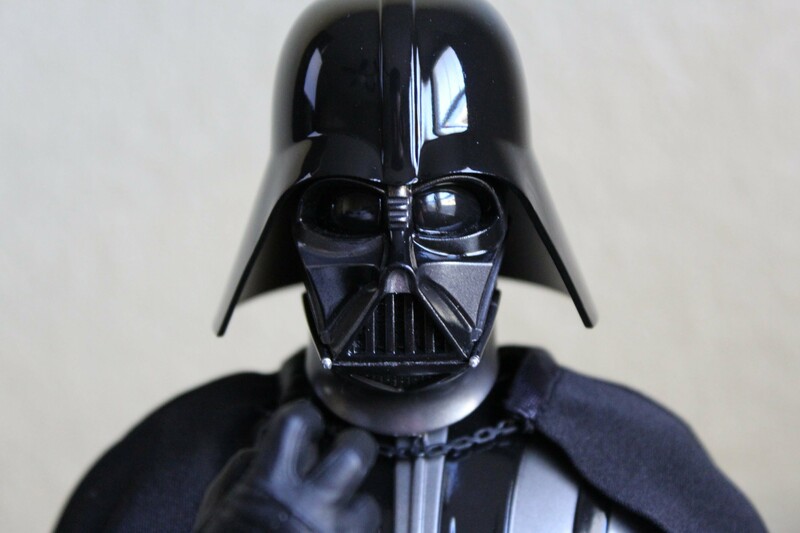 Lucas responded, negatively, and stated that especially samurai armor had been a significant influence on his conception of Darth Vader – the helm itself being both inspired by Japanese kabuto helmets, as well as early 20th century German war helmets. 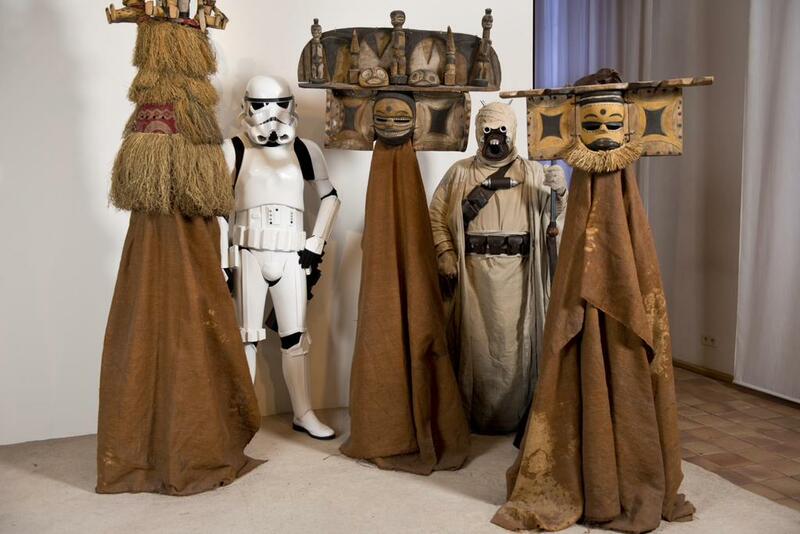 ps earlier this year Stuttgart’s Linden Museum shared the great installation shot below on Twitter (here), stating that George Lucas did study anthropology and got inspired by African masks. These fully costumed Ibibio masks indeed do look from outer space, but, as we know now, not from Star Wars’ galaxy. Image courtesy of the Linden Museum. This entry was posted in Research and tagged Ibibio, Mumuye on July 22, 2015 by admin. Mumuye figure. Height: 99 cm (including base). Image courtesy of the Fondation Beyeler. The above Mumuye figure is one of the major objects in the small, but exquisite African art collection of the Fondation Beyeler in Switzerland. You can browse the other objects in their possession here – there’s a small selection of Oceanic art as well. Their Mbembe figure will be shown during Warriors and Mothers: Epic Mbembe Art opening next month at the Metropolitan (info), while the big Kongo nkisi nkondi will be reunited with the other works of this artist during Kongo: Power and Majesty, also at the MET, end 2015 (info). This entry was posted in Collectors, Museums and tagged Mumuye on November 22, 2014 by admin.